The Secret Campsite Lewes is a chance for you and your family to connect with nature. We provide large camping pitches, screened and well spaced from neighbours, whilst enjoying access to great shower and toilet facilities. The campsite also has two glamping structures – The Tree Tent and The Gridshell. We have 3 camping areas on the site; the meadow, the bank which is ironically flat and the secluded orchard which adjoins a small pond. Each pitch has a campfire area, it’s what makes a real camping trip work. We also have a fridge aswell as a freezer, with ice packs. You are welcome to borrow these to keep food and important drinks cool on your pitch. A sense of discovery awaits as you cross the old bridge leading into the camping meadow which slowly reveals itself. Its seclusion ensures ink-black night skies and moments of silence, coupled with the chance for you to wake to an uninterrupted dawn chorus. 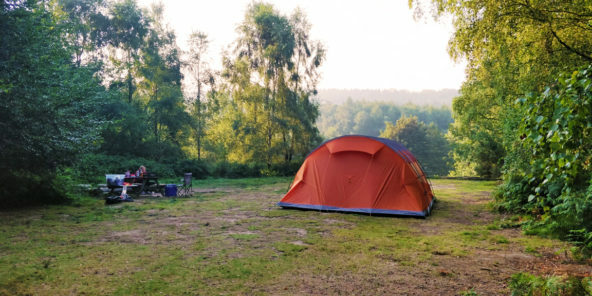 We are located in a beautiful and sparsely populated part of East Sussex and the camping meadows are enclosed by spaces that are alive with wildlife. This is really important to us. We are bordered by great stands of ancient and coppiced woodland. There’s also a site of nature conservation interest (SNCI) that runs straight through the camping areas. This mosaic of habitats is incredibly rich in wildlife and to compliment this, The Secret Campsite Lewes is lightly managed to create an environment where wildlife can thrive. The surrounding ancient woodland has been encouraged to advance at the edges of the camping meadow. This ensures an ever changing diversity of animals and plants for you to watch, hear, eat, smell and touch. Be it a glimpse of the deer passing through the woods or watching a sparrow hawk hunt along the hedgerows. A glow worm late at night, or hearing the nightingale sing after sunset accompanied by the frogs chorus. You will leave Sussex with great memories and experiences. By keeping the The Secret Campsite Lewes car and dog free, we help wildlife to flourish. This increases the number of encounters that you and your family will enjoy. It also ensures that the site is a safe place for children to roam freely and explore, and we have an area of woodland where dens can be built and trees climbed. Ultimately we are a campsite and not a theme park, but when you return each evening to the campsite from an exciting day exploring the Coast, the South Downs, the local towns of Lewes and Brighton or the Sussex countryside, you can relax around your campfire, and enjoy the peace and tranquility of nature.